As all make up junkies, I keep buying make up items, I like to change colors, textures according to trends, trying new things and whenever I see a limited edition something, I feel the urge to have it, it seems that limited edition screams "buy me" !. Anyway, like most of you I suppose, I do have a few make up and beauty essentials, the items I keep buying cause I'd feel lost without. I wanna tell you about them in this post !. Check those out and let me know whether we have any essentials in common or not, and what are yours !. Come tutte le amanti del make up, continuo a comprare nuovi prodotti, mi piace cambiare colori, textures a seconda delle mode, provare le novità e ogni volta che vedo una edizione limitata di qualcosa, sento il bisogno irrefrenabile di accaparrarmela, è come se accanto a "edizione limitata" ci fosse scritto "comprami" !. Comunque, come molte di voi suppongo, ho alcuni prodotti essenziali sia di make up che non che non mi faccio mai mancare perché senza mi sentirei persa. Voglio parlarvene in questo post !. Date un'occhiata e fatemi sapere se abbiamo qualche "essential" in comune e quali sono i vostri !. In the set above you can see some of my make up essentials (click on the image to enlarge it). Those are my must haves !. 1. Too Faced - Primed and Poreless primer - makes my face very smooth and it's a great base before foundation. It doesn't give me any problem such as pimples or dry skin feeling ! I have tried Smashbox and a couple of other primers but this one remains my absolute fave and I always have it in my make up bag!. 2. Too Faced - Shadow Insurance - another primer for eyelids this time ! Love it so much, it works so well against all fading, creasing and smudging and intensifies the color. The best one !. 4. Chanel - waterproof liner in ebene - a black eyeliner pencil, I love it ! The only bad thing is that these kind of lead pencil are likely to break up before their time is due, LOL. 5. Make up Forever Aqua smokey lash - ultra black mascara that lasts like forever and does wonders to me !. 6. Benefit - Erase Paste the best concealer to me, I use the lightest one and it covers up dark circles like no other. It's magic !. 7. Make Up Forever Aqua lip liner 3C - I am not obsessed with lip pencils, I don't even use them always but this one in this color (3C) is different...it works so well with any lipstick I have, either pink, beige or even coral color...and just makes the lips more beautiful without being noticed too much !. 8. Jane Iredale Pressed Powder - my compact transparent finishing powder is mineral based and it gives my face the right amount of matte effect without the baby powder effect I hate !. I keep it in my bag always for a quick retouch. Nel set che potete vedere sopra, alcuni dei miei prodotti make up essenziali (cliccate sull'immagine per ingrandirla). Sono i miei must-haves !. 1. Too Faced - Primed and Poreless primer - rende la mia pelle liscia e minimizza le imperfezioni. Non mi causa brufoli né altri problemi ! Ho provato il primer della Smashbox e anche un altro paio di primer ma questo rimane il mio preferito in assoluto e lo porto sempre con me !. 2. Too Faced - Shadow Insurance - un primer base per il trucco occhi ! Lo adoro, funziona alla perfezione ed oltre che evitare che l'ombretto vada nelle pieghette dell'occhio e sbavi, rende i colori più intensi e duraturi. Il migliore per me !. 3. Guerlain - Lingerie de Peau - fondotinta dalla texture leggera ma ugualmente coprente, IL fondotinta per me, dura a lungo senza necessità di ritocchi ed è facile da sfumare. Io uso il colore 03. 4. Chanel - waterproof liner color in ebano - un eyeliner che amo ! L'unica cosa che mi infastidisce è la mina estraibile che lo rende un po' delicato, non riesco mai a finire questo tipo di matite senza che si spezzino...ma l'effetto è ottimo e fa benissimo il suo lavoro. 5. Make up Forever Aqua smokey lash - mascara waterproof nero, lunga durata, sulle mie ciglia va a meraviglia...un must have !. 6. Benefit - Erase Paste, il miglior correttore per le mie occhiaie ! Per me è magico. Io uso la tonalità più chiara. 8. Jane Iredale Pressed Powder - la mia cipria compatta trasparente di fiducia è minerale, opacizza senza seccare e dare l'effetto borotalco che odio !. La porto sempre in borsa per un ritocco veloce !. In the set above you can see my beauty essentials. I never lack of these !. 1. J'Adore eau de parfum - my fave fragrance ever. I sometimes change perfume but I always get back to J'Adore. 2. Yes to Carrots body butter. This one is a must have if you want a very rich butter that leaves the skin very hydrated and soft. The price is quite cheap and it works perfectly !. 3. J'Adore deodorant. I use the same deodorant as my perfume cause I like the fact it intensifies the perfume. Moreover I do prefer the vapo version, I don't like stick roll-ons deodorants. 4. Caudalie nourishing lotion is another option after the shower and also in other moments of the day when I feel my skin is "thirsty". It is so easily absorbed and the smell is very discreet. 5. Yes to Carrots shower gel. This shower gel is just perfect to me, it leaves my skin smooth and soft (I have dry skin) and I like the delicate scent. Nel set che ho composto sopra potete vedere i miei beauty essentials. Non me li faccio mai mancare !. 1. Dior - J'Adore eau de parfum - il mio profumo preferito da sempre. A volte cambio fragranza ma torno SEMPRE da lui. 2. Yes to Carrots body butter. Questo è sicuramente un must have per chi desidera un burro per il corpo molto ricco che lasci la pelle super idratata. Il prezzo è abbastanza economico e funziona alla grande !. 3. Dior - J'Adore deodorant. Uso il deodorante con la stessa profumazione, mi piace perché intensifica il profumo e mi trovo molto bene con la versione spray, non mi piacciono gli stick roll-on. 4. Caudalie nourishing lotion è un'altra opzione per il dopo doccia e in altri momenti del giorno in cui la pelle tira essendo particolarmente "assetata". Si assorbe immediatamente e ha un profumo non invadente. 5. Yes to Carrots shower gel. Questo gel doccia è perfetto per me. Lascia la mia pelle soffice e idratata al punto giusto (ho la pelle secca) e mi piace anche il suo profumo molto delicato. And this is my latest obsession ! 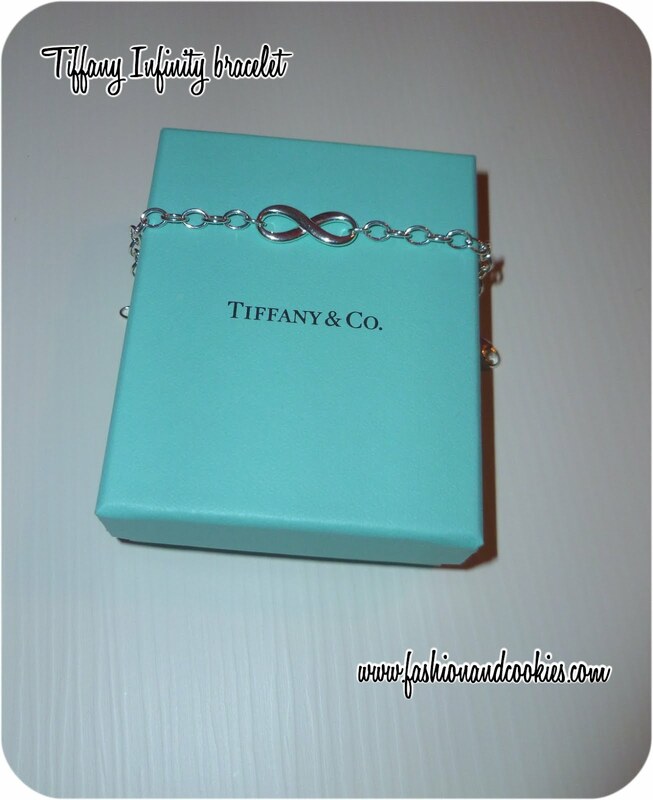 Tiffany Infinity bracelet in sterling silver :-). I am in love !. My twitter and Instagram followers already saw it. I've been lusting over this for a while and it's finally mine !. E questa è la mia ultima ossessione ! 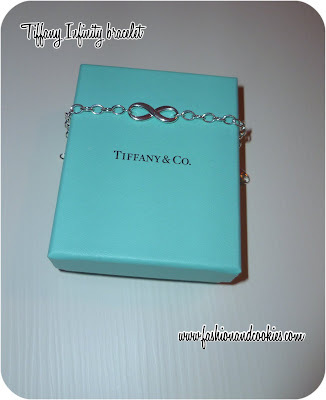 Il braccialetto in argento "Infinity" di Tiffany :-)...ne sono innamorata !. I miei followers su Twitter e Instagram l'hanno già visto. Era un po' che lo desideravo ed è finalmente mio !. 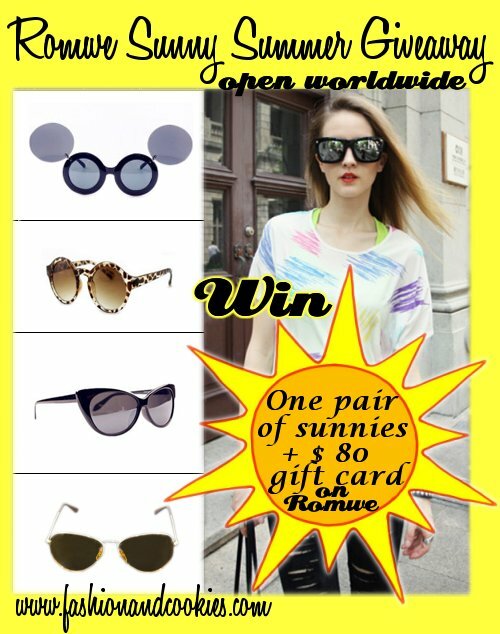 REMINDER: Romwe Sunny Summer Giveaway ! Let me remind you that thanks to Romwe and Fashion and Cookies you can win a new pair of sunglasses plus $ 80 freebies to do some free online shopping on Romwe !. This Giveaway is open worldwide, up until May 27th and you need to fill in the Rafflecopter form you can find clicking here ;-). Non uso nessuno dei tuoi prodotti! Mi hai incuriosito però e vorrò provarne qualcuno! Ciao Vale! 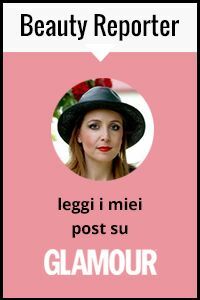 sono tutti dei prodotti favolosi! :) Un bacione cara! io vorrei tanto un tavolino come nella prima foto! Solo guardare la confezione di Tiffany , è gia sognare ! Definitely some great essentials! Always important! Love that Tiffany bracelet - it is perfect! Great items! Thanks for sharing!!! 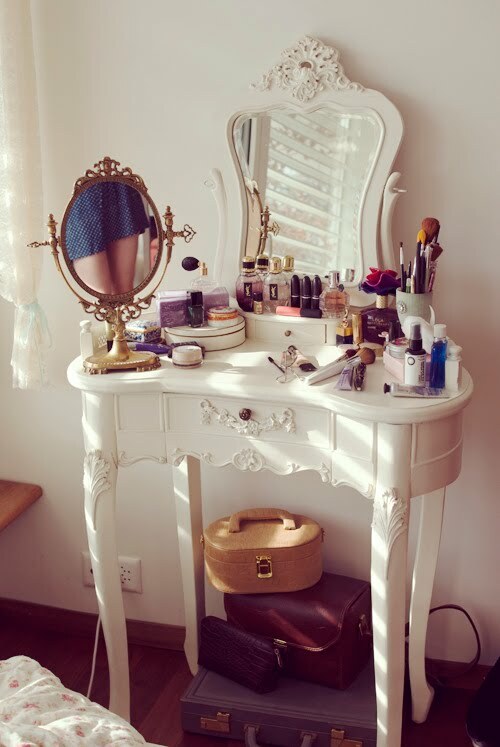 Love this post, always love advice on beauty products! 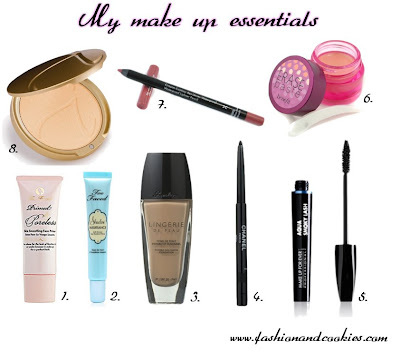 Great post and you have some great makeup essentials! Carinissimo il braccialetto! Non c'e' una cosa che non vorrei di Tiffany :P!!! Love your Tiffany & Co necklace. So cute! Great products, thanks for sharing darling! Gotta try one or the other someday! Love the Tiffany bracelet! You have a great collection of makeup! We can def. follow each other! Hi dear! Thanks for visit my blog, of course we can follow each other!! I follow you now, I hope you follow me back. Romwe Sunny Summer Giveaway: the winner ! New in: orange obsession !